I was too shocked by the giant cucumber to cook tonight. 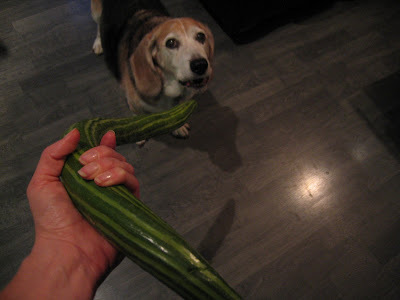 As pictured, this was indeed "an intimidating bit of cucumberage" as Sean said on sight. Miller thought it was worth a good bit of howling and prancing. Alas, there was nothing in the swap box to exchange for the butter lettuce. It will surely please the busily composting red wigglers. The mystery greens will get sauteed with the onions and squash. The carrots will become baked carrot fries. I'm on my own with the beets and potatoes, both will be roasted. Strawberries to the freezer. We might bronze the giant cucumber. No word from David on last week's box, but will report shortly.